Introducing a clubbing sensation like NOTHING you’ve ever experienced before. A fresh new level of excitement. A one of a kind clubbing adventure. One of Lebanon’s favorite DJ is back to Lebanese soil… Or Water ?! In The Middle of the Byblos sea!!!!! In the year where Sasha released Involver 3 – one of the most talked about electronic highlights of 2013, catch the legend himself in an event so out there, it’ll blow your mind. And the incredible Sasha putting his stamp on the tracks you love the best. The momentous night at Mar Mikhael train station set the bar high. Get ready for the next Mix FM extravaganza for Summer 2013. Innovative, fresh and completely different… Talk about breath-taking! 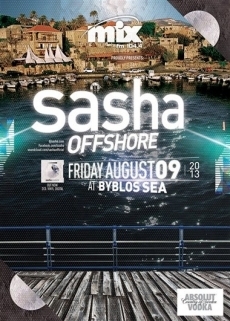 Sasha: Offshore with Mix FM. The kind of night you’ll look out to sea and wish you were a part of !! Tickets on sale at My Mix ABC from August 1st. 35$ for standing and 75$ for VIP tables, with limited premium tables for 110$. Opening set: Ronin & Nesta. © Byblos By Night. All Rights Reserved.